It is hard to imagine that someone who went through extensive physical and mental training, and served in high-stress situations, would be intimidated by a computer and keyboard. But for Jared Spude, a Political Science and Public Administration major, who served four years of active duty with the 101st Airborne Division of the U.S. Army, and many other veterans who return to a University setting, that was the case. “Being in the Army for four years and then coming back to school and thinking about writing papers scared the daylights out of me,” he said. Originally from Brussels, Wis., Spude graduated from Southern Door High School in 2008 and immediately joined the Army. After serving two years at Fort Campbell, Kentucky, and completing secondary job training, he was deployed to the Nangarhar Province of Afghanistan from August 2010 to 2011. Spude left active duty in November 2011 and started at UW-Green Bay just two months later. He says the welcoming nature of the UW-Green Bay campus community helped to make him feel at home. That nurturing environment and stepped-up services for veterans are among the reasons UW-Green Bay was named a “Military Friendly School” for the fifth consecutive year in 2013. UWGB dedicated the new “At Ease Veterans Lounge,” just last year for studying and socializing. 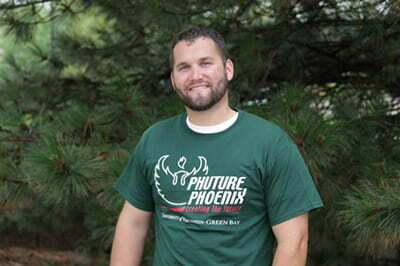 Campus location was one of Spude’s main criteria when he chose UW-Green Bay. He found UW-Green Bay’s atmosphere reminded him of his Door County home. Spude said when he returned, he had anxiety about interacting with other students and getting back into the academic environment. His first class upon returning was Education 295 with instructor Kim Desotell. The class involved working with the Phuture Phoenix program, which helps fifth-grade students see the value in a college education. While nervous about returning to the classroom, Spude said after that class he knew he’d made the right decision. Spude has been involved with the Phuture Phoenix program ever since. This semester he also serves as a peer mentor as part of the First Year Seminar program, and served on many committees, including the Student Representative to the UW-Green Bay Founders Board and Dean of Professional Studies student advisory board. He is also currently working with a political science group to found a capstone project. Outside of school, he teaches joint forward observers at the Wisconsin Military Academy in Fort McCoy, Wis. and serves in the National Guard. There is one group that helped to make his transition even easier: his family. Spude plans to graduate in May 2015 and get a position in city government or management. Spude is confident that his choice of school will help him get there. This entry was posted in Leading & Learning and tagged Phuture Phoenix, Political Science, Public Administration, student, veterans on November 6, 2014 by Sue Bodilly.